Rapid advances in financial services and technologies facilitate effortless and prompt transactions of money, worldwide. This exposes the financial institutes to the risk of money laundering thus making the mission of combating money-laundering more crucial and urgent than ever. According to United Nations Office on Drugs and Crime (UNODC), money worth of approximately 2-5% of the global GDP is laundered in a year, which ranges from $800 billion to $2 trillion in current US dollars. Governments of varied nations are forming their own regulatory bodies, in order to address money laundering. For instance, the U.K. established National Crime Agency (NCA) in 2013, which ensures to cut down crimes such as money laundering by monitoring high-end customers which include lawyers, trust and company formation agents, investment bankers, and accountants. 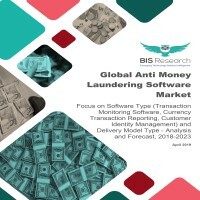 The report titled “Global Anti-Money Laundering (AML) Software Market” provides an in-depth analysis of the key development strategies and market trend dynamics which includes drivers, challenges, and opportunities prevailing in the industry. The report provides an extensive insight into various forms of developments, trends, and key participants. The Global AML software market estimation has been built on detailed assumptions and limitations. The market has been estimated by the type of software, their deployment type, and geographical analysis. The report profiles 16 organizations across different geographies allowing the readers to gain an insight into the various industry trends. • What are the major market drivers, challenges, and opportunities in the global AML software market? • What is the supply chain for the global AML software market? • What is the market value of AML software market for different software? • What is the market value of AML software market for different deployment type on the basis of on-premise and cloud? • What is the market value of AML software market on the basis of different geographical regions? • Which region is expected to dominate the AML software market? • What is expected to be the growth rate of different segments of the AML software market during the forecast period? • Who are the key players for the AML Software market? • What is the market share of the leading players in the global AML software market for 2017? Over the past five years, the financial service industry has witnessed far-reaching technology-led transformations, with companies looking for improving the efficiency of their financial departments by incorporating innovative IT solutions. In addition, customers have also set their expectations in terms of identity theft and are demanding added worth for their money, along with a seamless experience and better services. The banking software industry has witnessed significant developments in the past decade, in terms of understanding, exploring, researching, managing, and utilizing resources to create value. A similar trend is expected to prevail in the next decade and banking software industry is expected to evolve in terms of facilitating global, multi-service, low-cost, and digital banking. However, with the growth in the banking software industry, there is an increasing demand for regulators to counter the upsurge in the financing of terrorism and money laundering incidences. Technological advancements in financial services have resulted in an increase in the number of wired transactions, worldwide. However, these smooth and prompt transactions have exposed the financial institutes to the risk of money laundering, thus increasing the concern for the same. According to United Nations Office on Drugs and Crime (UNODC), money worth approximately 2-5% of global GDP is laundered in a particular year, which ranges from $800 billion to $2 trillion in U.S. dollars. Governments of various nations are forming their regulatory bodies, in order to address money laundering. This has led to an increase in the market penetration of counter terrorism financing (CFT) and anti-money laundering (AML) regulations in the financial services industry, driving organizations to reinvent their compliance processes in order to act in accordance with the regulations and circumvent the possibility of fines and sanctions. Regulatory bodies, such as The Financial Action Task Force (FATF), Asia/Pacific Group (APG), and The Anti-Money laundering Association (AMLA), have been pivotal in shaping the future of the AML industry. On-premise deployment type contributed the largest share to the AML software market in 2017, owing to higher level of consumer data security provided as compared to cloud deployment. However, cloud deployment is expected to witness higher growth rate during the forecast period. This delivery model requires monthly or yearly subscriptions, which are cheaper as compared to on-premise deployment software. The widespread adoption of cloud-based delivery models is expected to be witnessed in future, due to the lower entry cost than that of on-premise deployment models. A cloud-based deployment model involves the combination of cloud computing with wireless sensor networking, and mobile computing to automatically provide the users with the required data. Transaction monitoring software had the highest market penetration rate in the overall AML software market in 2017, followed by currency transaction reporting, customer identity management, compliance management software, and others. Transaction monitoring software accounted for the highest market share in the AML software market for 2017, owing to generate full-fledged analysis of a customer, thereby facilitating prediction of risk levels and future money laundering activities, along with providing reports and creating alerts for suspicious activities. The North America region dominated the AML software market in 2017 and is expected to continue to dominate the market, owing to stricter customer identification regulations and compliance for the financial institutions in order to reduce money laundering activities. The Asia-Pacific region is expected to foster the highest growth rate in the market during the period, 2018-2023. Factors such as increasing regulatory compliance, adoption of stringent AML regulations, and adoption of the software in various institutions are the major reasons for the constant growth of the AML software market in the region.